Is there a KAR member or other runner who has been a source of inspiration to you in your running? How about a member who has made an exceptional comeback, overcame obstacles, shown incredible improvement or has demonstrated competitive excellence or volunteerism? These categories and more are all part of the Kalamazoo Area Runners (KAR) Runner Recognition Program. The Runner Recognition Program is your opportunity to recognize those who have inspired you. Nominations are due January 31, 2019. Nominees must be members of the Kalamazoo Area Runners by February 28th in order to win, but feel free to nominate any runner who has been an inspiration. If a nominee is not a member, we will reach out to invite them to join! Prior award winners can be re-nominated! Board Members eligible except for Volunteer of the Year Awards. Contact Bonnie Sexton at bonnie.sexton@kalamazooarearunners.org with questions. Demonstrates an exemplary level of volunteerism within Club sponsored events and programs as well as those that benefit the running community and community as a whole. Shares their love and passion for the sport and serves as a positive role model and source of inspiration and encouragement to others. Runner who started running the current year and demonstrates outstanding potential or progress, dedication and sportsmanship. Runner who has been on hiatus for a year or more and makes a notable comeback. 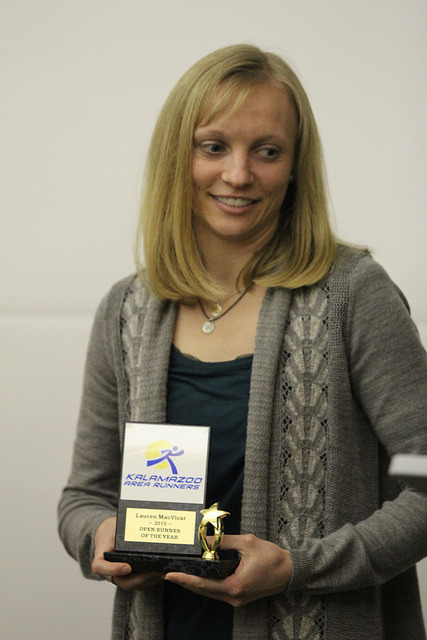 Runner who has overcome challenges and/or achieved significant goals over the past year. Runner who has shown the most improvement over the past year in race times. Posts the most marathon completions for the current year. Strictly based on number of completions. Name of Marathons Completed must be provided. Posts the most race completions (5k – Ultra) for the current year. Strictly based on the number of completions. Events may be relays or fun runs as long as the leg or race distance is 5k or greater. Names of races completed must be provided. Posts the most trail race completions (5k – ultra) for the current year. Strictly based on the number of completions. Events may be relays or fun runs as long as the leg or race distance is 5k or greater. Names of races completed must be provided. Posts the most ultra marathons (50k or above) for the current year. Strictly based on the number of completions. Names of races completed must be provided. Welcomes and draws people into the running community through demonstrating a warm and friendly spirit. Frequently shares fun stories and experiences for the News Rundown and other Kalamazoo Area Runners related Communications. Runner under age 12 that demonstrates competitive excellence, sportsmanship & serves as a positive role model to others. Demonstrates competitive excellence by winning open titles frequently, sportsmanship & serves as a positive role model to others. Demonstrates competitive excellence by winning masters or open titles frequently, sportsmanship & serves as a positive role model to others. Demonstrates competitive excellence by winning grand masters, masters or open titles frequently, sportsmanship & serves as a positive role model to others.